my e-copy from netgalley, at the invitation of the publishers. Thank you so much! 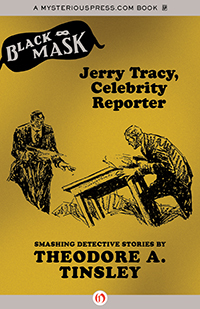 In just a few days from now (8/27), Open Road Media plans to release an ebook collection of stories called Jerry Tracy, Celebrity Reporter: Smashing Detective Stories by Thedore A. Tinsley. This particular ebook is just the beginning of a series planned by Open Road Media/Mysterious Press, an homage of sorts to the old Black Mask crime magazine. Along with Tinsley, upcoming authors in the series are Paul Cain, Norbert Davis, and Steve Fisher. Now that my appetite has been whetted by Jerry Tracy, I foresee much more Black Mask noir in my near future. "...past the black carcasses of department stores and furniture warehouses. Over towards the Hudson, towards the strings of rickety and condemned tenements that only a cycle of depression years had saved from the pick axes and rubbish chutes of the house wreckers." It's also a New York where a wrong word in a newspaper gossip column can ruin careers or individuals and can serve as a motive for murder -- or at least payback. Jerry Tracy works as a columnist at New York's Daily Planet. In the book's introduction, Boris Dralyuk notes that Tracy is a fictional counterpart to Walter Winchell. Tracy "packs a mean punch and can handle a Remington pistol as skillfully as he can a Remington typewriter. " 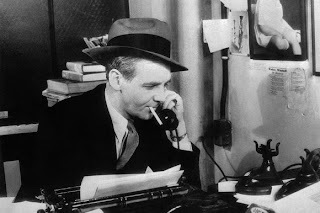 He writes out of an office overlooking "the helter and skelter of Times Square," and although the country is in the thick of the Depression, he earns a "princely salary" to keep the dirt flowing for the million Planet customers who would stop buying without his column. He lives in a penthouse with a Chinese servant named McNulty, his "butler, major-domo, conscience and guide," and has a big-lug sidekick named Butch. Tracy wears other hats as well -- over the years, the police have profited from his keen detective skills, as he often passed along info good enough to give him an in with Inspector Fitzgerald, the "Gruff Guy in Centre Street." He is tough on crime and feels that parole is too easy, the product of "an easy-going system that got sentimental and forgiving as the years rolled by. " Tracy is tough as nails on the outside and can deal with the worst crooks and the toughest dames on the New York streets, but inside he can be as soft as a marshmallow when his sense of injustice is piqued -- especially when it comes to old friends or women in distress. He knows everyone from hotel desk clerks to elevator operators, from taxi drivers to the owners of swank clubs with names like "The Pom-Pom," "Club Espaňol," or "Club Humpty Dumpty", many of whom are his friends and help him out with information from time to time. 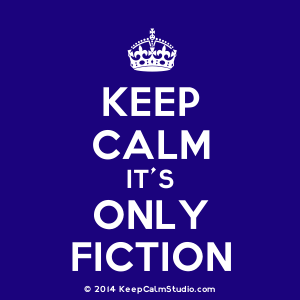 Something bound to pop up in readers' minds while reading is the author's use of racial slurs or, as in the case of Tracy's manservant McNulty, ridiculous pidgin' English and stereotypical Charlie-Chan type "me-likee" kind of language. Let me just say that while modern readers may be offended, or as in my case very much taken aback, these stories were written a very long time ago and this sort of stuff was part of the everyday vernacular. Try not to judge these parts too harshly -- things were very different 80 years ago. Overall, though, Tinsley's story telling, the New York setting and Jerry Tracy himself make for hours of excellent reading -- this is probably a book where you want to read a few stories at a time, put down your reader and come back to the stories later in small bits so you can savor every second. Highly, highly recommended for people who enjoy classic crime fiction and want to discover a new author -- or for people starting to cut their teeth on pulp or noir crime. Super duper good and a real treasure. I did a bit of digging, and found an old (black-and-white of course!) movie based on Tinsley's hero: "Murder is News." I'll definitely be watching!